in my mind, there is nothing better than bundling up in a quilt on a cold autumn evening. i have started a collection of blankets, quilts and bedding of all kinds. the more, the merrier. like right now, i have what i call Christmas on my lap, tucked over my feet. (yes, all our quilts have names. some people have cats, we have quilts.) last winter, i'd wrap up in a quilt and sit next to our heater vent, getting all toasty like a slice of sourdough. but wait, maybe there is something better.. it's bundling up with someone you love. and for me, it's bundling this li'l someone who is 12 pounds and 21 inches. 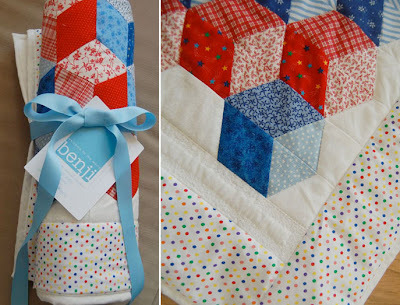 i feel so grateful for all the sweet handmade quilts and blankets that have come in honor of our babe benj. i don't sew, quilt or thread needles, so to me, a handmade blanket is a true gift from the heart. thanks to those who have spent their time, energy and effort sewing up a bundle blanket for my new bundle of joy. and you can never have enough blankets. now that our baby boy has outgrown his cradle, i've loaded it up with his quilts. so inviting, so perfect. thank you. here is one of our favorite new keepsakes. my sister-in-law, elizabeth says this beautiful block quilt is easy to make. hmmm, perhaps.. but keep in mind, this is coming from the girl who hosts 40+ people for thanksgiving, has her babies natural and runs marathons as often as i make cookies. thank you, i simply love the laura ashley vintage material. truly special. thanks for your words. as always, they leave me inspired to write, to do, to create, to make the most of life. I love that you name your quilts!!! m, I have a "Christmas" of my own that I love to snuggle under. I shall now start referring to it as just that. that lovely pattern is called "tumbling blocks" or "baby blocks" and once you master the challenge of having the 3 corners meet neatly, it is easy! The quilt is gorgeous. Definitely something that will become a family heirloom! She sounds like quite a lady. I love the quilt!